Among the historic clergy of Bottesford, one of the less well remembered is William Mounsey, Curate of Bottesford from 1781 to 1793. What we do know suggests an energetic and gifted young man, very much of his time, who deserves to better known. But finding out very much about him has proved frustrating, as we shall see. We come across The Reverend William Mounsey in the pages of John Nichols’ The History and Antiquities of the County of Leicestershire. This was a major work published in four volumes, each of two parts, between 1795 and 1815. Nichols, a London-based antiquarian and publisher, Fellow of the Society of Antiquaries and editor of the Gentleman’s Magazine, acted as compiler as well as author of his account of Leicestershire, incorporating contributions from a variety of others in assembling this vast work. His description of Bottesford and other villages in the Vale of Belvoir was included in Volume II Part I – containing Framland Hundred, published in 1795. Nichols included a scientific introduction to the Vale entitled The Natural History of the Vale of Belvoir under the authorship of George Crabbe in Volume I Part I The Town of Leicester, which was also published in 1795. Volume I Part I starts with a series of general accounts including Nichols’ record of the Domesday Book on Leicestershire. Then follows A Catalogue of some of the more Rare Plants found in the Neighbourhood of Leicester, Loughborough and Charley Forest, and then The Natural History of the Vale of Belvoir. This last was made up two parts, firstly Crabbe’s own account followed by an account by William Mounsey. The first half of The Natural History of the Vale of Belvoir describes the fauna, flora and geology of the Vale. Crabbe was a keen probably self-taught naturalist who studied the fauna and flora of the Vale in some detail. This must have been during his time as chaplain to the Duke of Rutland, curate of Stathern, and finally Rector of Muston and West Allington (1782 to 1792 altogether). His account of 1795 had already been published in 1790 in Nichols’s Bibliotheca Topographica Britannica (viii. 1256-91), as recorded in by Thomas Faulkner and Rhonda L. Blair in Selected Letters and Journals of George Crabbe (Clarendon Press, Oxford, 1985). Crabbe also recorded botany in his native Suffolk, compiling a list of flowering plants that was published in Loder’s History of Framlingham in 1798. 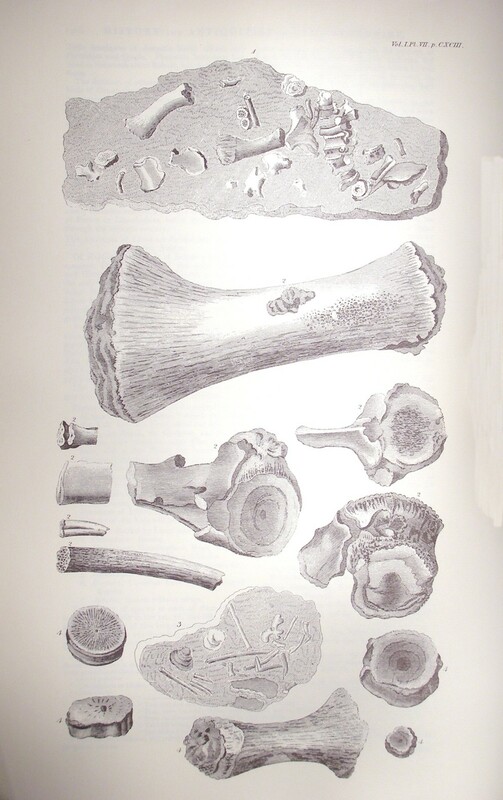 “AN ACCOUNT of the STRATA of STONE and the FOSSIL BODIES found in the VALE OF BELVOIR; accompanied by THREE PLATES of the more curious PETRIFACTIONS engraved from SPECIMENS in the Possession of the Reverend WILLIAM MOUNSEY, by whom they were collected, arranged, and described.” [capitals as printed]. This gives a clear geological account and systematic description of fossils found in stone pits in Bottesford, Easthorpe, Normanton and Orston, accompanied by three engraved plates with pictures of selected fossils. The plates were made by Jacob Schnebbelie, a distinguished artist and engraver employed by Nichols for his book on Leicestershire and also by the Society of Antiquaries as their principal illustrator. The text is by William Mounsey, though what we see is actually a translation by Crabbe of Mounsey’s latin into english. We can establish (see below) that William Mounsey was curate in Long Bennington from 1777 to 1781 and then at Bottesford from 1781 to 1793, after which he was vicar jointly of Sproxton and Saltby. His visits to stone pits in the Bottesford area were most probably over by 1793. A full transcript of the Natural History can be found using this link. Crabbe’s letters, reproduced by Faulkner and Blair (1895), refer to collaboration between him and William Mounsey as early as 1791. Letters written in 1798 and 1799 suggest a degree of frustration in that Crabbe, acknowledging the high quality of Mounsey’s fossil collection, thought that it should be made available for him (Crabbe) to write the description for Nichols, whereas reading between the lines it seems that Mounsey had other ideas and was holding back. A letter from 1807 indicates that it was Mounsey (not Crabbe) that had the three plates made by Schnebbelie and then allowed Crabbe to see them. By 1809 Crabbe seems to have had Mounsey’s text as well, and had decided to translate it into English. A letter to John Nichols dated 25th January 1809 reads: ” … there was not much more to do than copy Mr Mounsey but I thought it much better in an english work & not one professedly on a Scientific Subject to put the Descriptions into our own Language, not merely because the latin has a pedantic Appearance but because I conceived some of your Readers might choose to look at this short Account of Leicestershire fossils who were not accustomed to scientific Definitions … “. There is perhaps an echo of Crabbe’s unfortunate experience of having the manuscript of his Essay on Trefoils criticised by his friend John Davies, Vice Master of Trinity College, “because a savant could not, on pain of losing caste, write in any language but latin” (George Crabbe and his Times, 1754-1832, by Rene Huchon, 1968, p.205). Crabbe never did translate it, and eventually consigned in to the bonfire. There is, perhaps, the impression that the two authors did not get on very well. Crabbe’s family are known to have referred to the curate of Bottesford as “Mousey”, while it is also clear from Crabbe’s letters that he had held on to Mounsey’s notes that had been lent to him, in spite of repeated requests for their return. One detects a degree of rivalry and perhaps jealousy between them. William Mounsey’s years in Bottesford coincided with a large part of Crabbe’s time as chaplain to the fourth Duke of Rutland (1782-1785), curate at Stathern (1785-1789) and Rector of Muston (1789-1792). He then departing for several years in Suffolk though still Rector of Muston, by which time Mounsey was established as a parish priest and was probably well known to his patron, the Duke of Rutland, as well as to Nichols. There may have been pressure from these on Crabbe to include Mounsey’s work along with his own, and Crabbe may have been making the best of the situation by adding Mounsey’s work while keeping his own name to the fore. William Mounsey’s account (pages cciii to ccviii plus three plates in Nichols Volume IV Part II) starts with introductory paragraphs written in fact by Crabbe, then Mounsey’s account itself follows. Mounsey describes at some length the form of the strata of stone as observed in the various stone pits he examined. He then gives a fascinating section in which he recounts borings made by John, Duke of Rutland, “about 40 years since” (presumably the third Duke of Rutland, 1696-1779) in the hope of finding a source of coal within his estate. In the 213 feet deep hole, some fourteen inches thickness of “soft coal” were encountered at a depth of 169 feet. A second boring was made from a point on higher ground: this one reached a depth of 469 feet, but no more coal was found “so that no judgment could be formed of the stone, coal, or other mineral bodies, which any untried spot was likely to produce”. We can well understand the Duke’s wish to find coal seams, but the question is how exactly were the borings made, bearing in mind that the date ca.1750 was well before steam-power was available to drive the boring machinery or pump water out of the borehole: it would be fascinating to know the answer ti this. Also, who was the engineer, and how did he determine the depth and thickness of the coal intersected in the first of the borings? Mounsey describes “star-stones” (rich in the five-sided sections of the stems of crinoids or sea-lilies), fossilised wood, soft mudstone, and ammonites ranging from minute to three feet in diameter. He describes what appear to be nodular or blocky fossiliferous limestones. He describes fossils of bones, some originating in “cetaceous fish … in the order Mammalia” others to “some short thick quadrupede”. 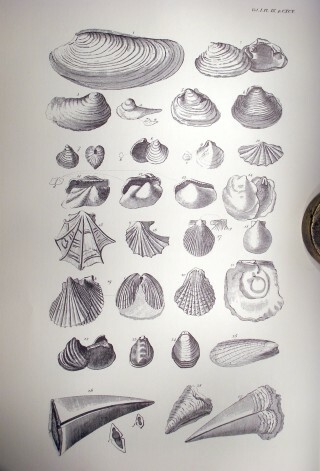 Examples are shown in the first of the three Plates, and Mounsey makes comparison between his finds and fossils shown in Plates published by Brander (Gustavus Brander, 1720-1787, FRS, a Swedish naturalist, studied fossil shells in Hampshire, became a governor of the Bank of England – Wikipedia) and Dr. Solander (Daniel Solander, FRS, 1733-1782, a Swedish naturalist and follower of Linnaeus, who sailed with Joseph Banks’ on the Endeavour and became librarian of his collections) as well as Woodward’s museum collection at Cambridge (John Woodward, 1665 – 1728, Fellow of the Royal Society, collected and catalogued fossils from Gloucestershire, made bequests which in 1728 established the Woodwardian Professorship in Geology and the associated Woodwardian museum at Cambridge. This was the first such chair at a British university). Mounsey refers to a block of stone some four feet long discovered by Reverend Turner, Rector of Denton, containing bones from the skeleton of an animal “not much distorted from their natural position” and “completely petrified”, but he does not speculate what creature it may have been. He records fossils horns of “some animal … of the genus Bos” found at Bottesford “larger than those of any taurine species we are acquainted with”. He records “certain parts of marine amphibian” which include “petrified teeth of the Shark”. He moves on to a systematic account of fossil shells of ammonites, gastropods, molluscs, clams, oysters (including what he calls “the Gryphyte or Crow-stone – most probably the Gryphaea well known in the area as the “Devil’s Toe-nail”), echinoids, belemnites (“Thunder-stones”), crinoids and corals. 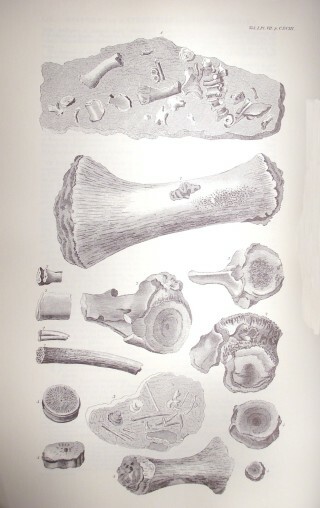 Finally, Schebbelie’s three plates illustrate with great clarity a selection of Mounsey’s fossil bones and shelly fossils, as referenced in the text. It is clear that Mounsey had well versed in the palaeontology of his day. He could identify the fossils shells he had found and was able to use binomial classification in naming them. This implies that he had had the opportunity to study collections of such shells at a location where the latest taxonomic methods were in use. It is tempting to infer that he must have been at either Cambridge or Oxford (most probably Cambridge, in that he refers explicitly to Woodward), though he is not listed among the alumni of either university. What became of the fossil collection we do not know, nor do we know if William Mounsey went on collecting after he had left Bottesford and settled down in Sproxton and Saltby. His widow may have disposed of it, or it may have been given to his patrons at Belvoir Castle. It would be a delight to re-discover it. “These monuments are now kept neat and in fine preservation. As no attention had been paid to them in the memory of man, they suffered severely by time, but more by ill usage. The iron rails that guarded them were broken down; and, by an easy calculation from what remained, more than three hundred weight had been carried off. In consequence of this, trampling upon the monuments at pleasure to read the inscriptions, which were so obliterated as to be illegible without it, was the practice of every curious traveller. A great part of the ornament and delicate work was by accident and, too often, by wantonness destroyed. Part was found buried in the rubbish: but the greater part was entirely lost. An indulgence also of a bad custom, which all the children in the parish claimed as a privilege, of playing in the church on Shrove-Tuesday (always a day of riot), contributed not a little to this devastation. Even allowing for further work carried out since Mounsey’s time, it is clear that his efforts were a vital to the survival of the monuments to the present day. Was he paid by the Duke for his labours? 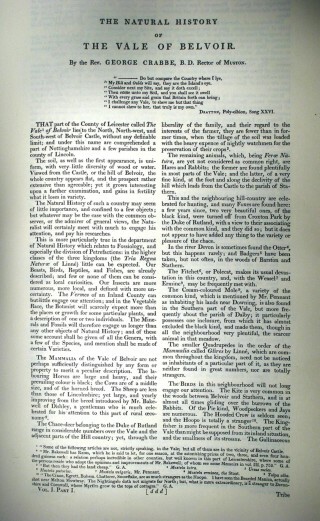 Mounsey’s death in 1818 was marked in the Gentleman’s Magazine with a short obituary note which reads: Rev. William Mounsey, April 30th, died at Sproxton , Leicestershire, after a severe illness of a paralytic tendency … a most conscientious parish priest and an Israelite without guile. Of his literary talents abundant specimens may be seen in the descriptions of his two small Parishes in Mr. Nichol’s History of Leicestershire; in which is also a valuable and scientific account, by Mr. Mounsey , of the petrifactions, strata of stone and fossil bodies found in the Vale of Belvoir. Of his mechanical talents and patient perseverance, the complete reparation of the fine monuments of the Earls of Rutland in Bottesford church will be a lasting memorial … For that matchless industry Mr Mounsey was presented, in 1792, with the two small vicarages of Saltby and Sproxton , at which latter place he constantly resided; and in 1811 had the satisfaction of presenting to his Noble Patron, the Duke of Rutland, a small urn, found that year in Sproxton , containing exactly 100 silver coins. Mr Mounsey has left a widow, and one daughter. Present day visitors to Belvoir Castle will have admired the scale model that is on display of the castle as it was in the 18th Century. This was made by William Mounsey. We can build up a picture of William Mounsey as an energetic, enthusiastic young man eager to prove himself both in the performance of his religious duties and in pursuing the education in history and natural philosophy that he had enjoyed. He would have lived in the Glebe House in Bottesford, now No.1 Chapel Street. Perhaps he married around the time he moved up in the world, presented with the vicarages of Sproxton and Saltby (and their attendant income). But this is merely conjecture. John Thoroton, who became rector in 1782, soon after Mounsey became curate, was an amateur but able architect who in 1789 restored and extended the old Rectory at Bottesford, as described by Michael Honeybone (Book of Bottesford, 1980) who points out that Thoroton had the oldest (pre-1702) part of the building demolished, retaining the handsome stone house originally built by Rector Abel Ligonier, and adding the brick-built eastern extension. One imagines that he and Mounsey were an industrious team. The years from 1781 to 1793 follow the parliamentary enclosure of the parish of Bottesford, at a time when “feudalism gave way to capitalism”. These were the days of the turnpike before the Grantham Canal was built. Villagers had lost their rights to graze the commons and gather fuel from the woodlands, and been obliged to work for weekly wages and pay cash for almost everything they needed. Farmers flourished but in a farming village like Bottesford there would probably have been hardship and resentment among the labourers. The Bunkers Hill poor cottages had been opened in 1779, and more were to be built on the High Street (Hands Cottages) and Chapel Street (Wright’s Yard). 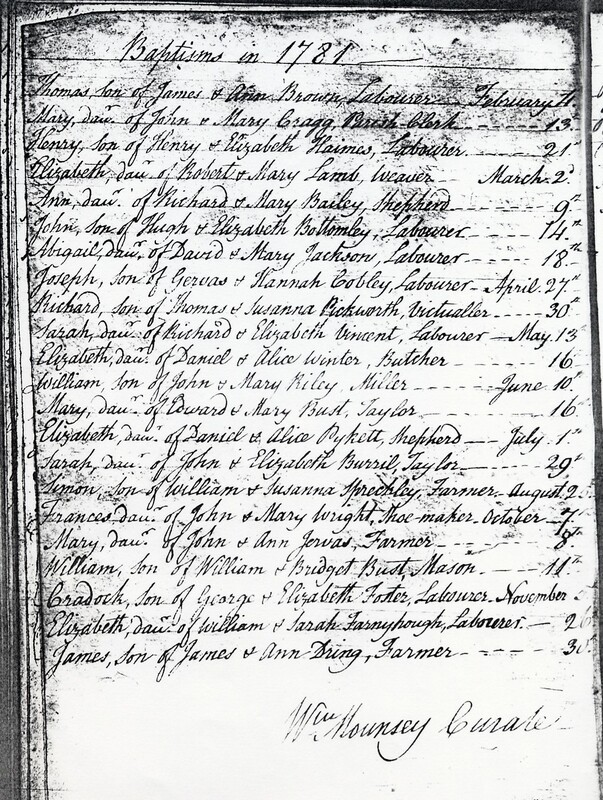 Michael Honeybone records that the population of Bottesford was at a low point at about 1790, possibly due to repeated outbreaks of smallpox, and only expanded in the decades afterwards. Many had left the Anglicans and joined the dissenting churches. St Marys itself was in poor repair, suffering perhaps from decades of neglect, and the monuments had become damaged. Charles the Fourth Duke of Rutland died in 1787, but the dowager duchess Lady Mary Isabella (daughter of the fourth Duke of Beaufort) lived until 1831. Charles had taken up residence in Dublin in 1784 when he became Lord Lieutenant of Ireland, and had there. He was succeeded by John, 5th Duke of Rutland, who married Elizabeth Howard (daughter of the Earl of Carlisle) in 1799. The couple undertook re-building Belvoir Castle under the direction of the architect Charles Wyatt, though he died in 1813, and the work was completed under the direction of the Rector John Thoroton. We know very little about William Mounsey’s life, and what facts we do have appear to be confused. The Clergy of the Church of England database (CCEd) provides information about the career of, not one, but two William Mounseys. 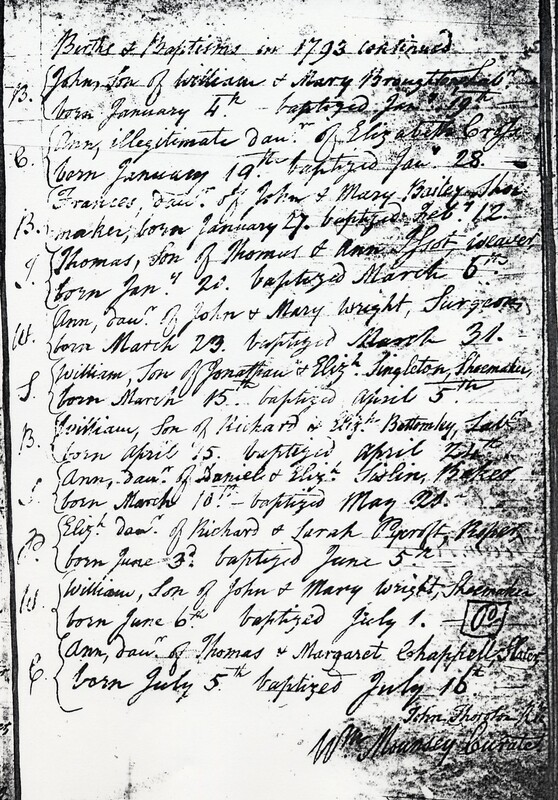 Both records omit Mounsey’s time at Bottesford, presumably an oversight by the CCEd compilers: Bottesford parish records of christenings and burials carry his signature every year from 1781 to 1793, so there is no doubt that he was curate at St Mary’s! 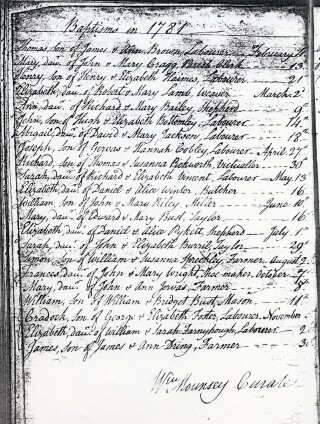 (Record 1) William Mounsey (records from 1777): ordained as a priest on 24/2/1777 by John Green Bishop of Lincoln at St Martin’s parish church Ludgate, London, who also licenced him as curate of Long Bennington, Lincs, on this same date, stipend £40. (Record 2) William Mounsey (records spanning 1777-1831, providing much more information) was educated at Louth Grammar School, then in 1778 went to Emmanuel College, Cambridge, as a sizar. Matric. Michs in 1778, BA 1782, MA 1794. (Faulkner and Blair, 1985, give the date of Mounsey’s M.A. 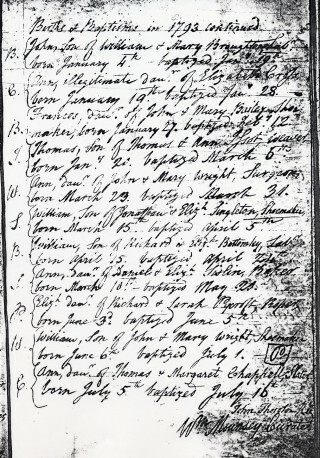 as 1784 rather than 1794, and of his time in Bottesford as 1784 to 1789 – but these dates would appear to be in error). 21/9/1783 – ordained as priest at Buckden Prebendal Church, Hunts, by Thomas Thurlow, Bishop of Lincoln, who also licenced him as curate of Panton, Lincs, on this date, stipend £31-10s. 2/11/1818 – death of William Mounsey Vicar of Sproxton with Saltby annexed, succeeded as Vicar by Henry Willson Salmon. 27/2/1831 – death of William Mounsey Rector of Thoresway since 1806, succeeded as Rector by the curate Edward Cove. 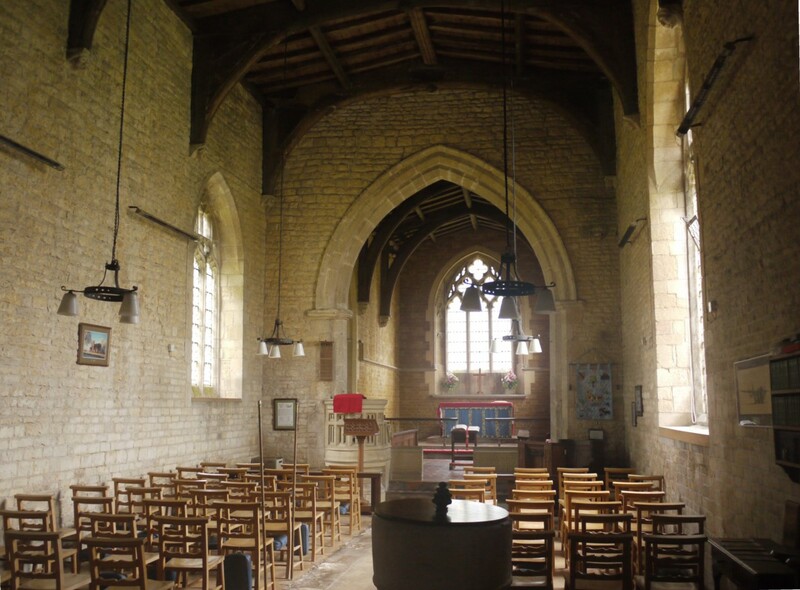 8/6/1831 – death of William Mounsey Vicar of Stixwold, succeeded as Vicar by Bernard Cracroft. And of his sister Mildreda Mounsey, daughter of the late Rev. John Mounsey, who died Oct. 3rd MDCCCXVI in the 58th year of her age. An unassuming Integrity gained Him the esteem of many Friends: and a Proneness to relieve, the respect of the indigent. Clearly, William Mounsey cannot have been ordained and then died twice. It is most probable that the CCE database has confused two parsons of the same name. 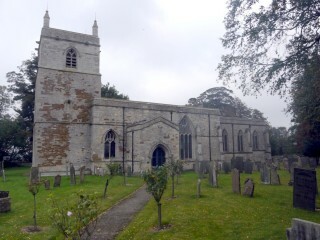 William Mounsey of Bottesford was ordained in 1777 becoming curate of Long Bennington, curate of Bottesford from 1781 to 1793, and then vicar of Sproxton and Saltby till his death in 1818. Presumably he ceased to be curate at Long Bennington when he moved to Bottesford, though the next curate at Long Bennington was not appointed until 1797, on a stipend of £50. The Gentleman’s Magazine of 1818 gives a brief obituary using much the same words: Rev. William Mounsey April 30th, died at Sproxton, Leicestershire, after a severe illness of a paralytic tendency … a most conscientious parish priest and an Israelite without guile. Of his literary talents abundant specimens may be seen in the descriptions of his two small Parishes in Mr. Nichol’s History of Leicestershire; in which is also a valuable and scientific account, by Mr. Mounsey, of the petrifactions, strata of stone and fossil bodies found in the Vale of Belvoir. Of his mechanical talents and patient perseverance, the complete reparation of the fine monuments of the Earls of Rutland in Bottesford church will be a lasting memorial …For that matchless industry Mr Mounsey was presended, in 1792, with the two small vicarages of Saltby and Sproxton, at which latter place he constantly resided; and in 1811 had the satisfaction of presenting to his Noble Patron, the Duke of Rutland, a small urn, found that year in Sproxton, containing exactly 100 silver coins. Mr Mounsey has left a widow, and one daughter. Illustrations of the Literary History of the 18th century Volume 6 page 171 1831 by John Bowyer Nichols, in which B.N. Turner writes: As a better illustration, let me observe that, at Bottesford in Leicestershire, there are many beautiful monuments … Now these monumental figures having been much impaired by time, one perhaps having lost a finger, and another a toe, or some of their appropriate ornaments, my late worthy and learned friend and neighbour, the Reverend William Mounsey, on taking that curacy some years ago, for his own amusement set himself to work, and most ingeniously restored them to their original appearance and beauty*. Also a footnote – For that matchless industry Mr Mounsey was rewarded in 1792 with the two small vicarages of Saltby and Sproxton, at which latter place he afterwards resided … [He] gave Mr Nichols great assistance in the description of his two parishes; and also contributed to the History of Leicestershire a scientific account of the petrifications, strata of stone, and fossil bodies, found in the Vale of Belvoir. As a parish priest he exhibited the character of a conscientious pastor and an Isrealite without guile. He died at Sproxton, April 30th, 1811, leaving a widow and one daughter. This is virtually all we have unearthed about William Mounsey of Bottesford (thus far). We do not know where he came from or when he was born. We do not know if his will exists, not have been able to consult Sproxton parish records (neither these, nor William Mounsey’s will, is held in the Leicestershire County Archive). We do not know where he received his education, though it is clear that he was an educated man. He is not recorded in the records of the alumni of Cambridge and Oxford Universities, held in the Lincolnshire Archive. The other William Mounsey was educated at Emmanuel, was curate at Panton, vicar of Stixwold and Rector of Thoresway, dying in 1830 and commemorated at Caistor. 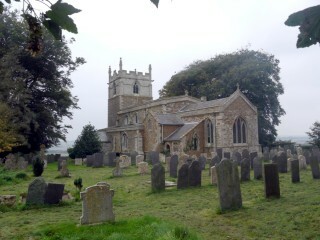 The Gentleman’s Magazine of 1830, page 645, gives a brief obituary notice: “The Reverend William Mounsey, Rector of Thoresway, and Vicar of Stixwold, Lincolnshire. He was of Eman. Coll. Camb. B.A. 1782, M.A. 1794; was presented to Stixwold in 1802 by Edm. Turnor esq. , and to Thoresway in 1806 by the Lord Chancellor.” It cannot be a coincidence that his patron, while vicar of Stixwold, was Edmund Turnor of Panton House. He was also fortunate in that his father, John Mounsey, had been rector of Thoresway, a position which William took up on his father’s death in 1806. William Mounsey’s will, held in the Lincolnshire Archive, indicates that at his death his fortune amounted to almost £7000, a tidy sum in 1830. There is no indication that he was a naturalist, nor is there any reason to think he ever visited the Vale of Belvoir. Where did William Mounsey of Bottesford learn his science? The account in Nichols clearly indicates a familiarity with geology and palaeontology (“fossiling”). 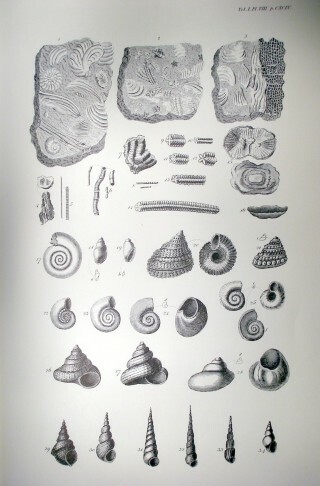 It also appears to show a familiarity with the binomial system of classification, as here applied to fossils. Cambridge University had a chair of geology and a museum of geology by the mid-18th Century: the Woodwardian Professor of Geology from 1764 to 1778 was called Samuel Ogden. Could our William Mounsey have attended his lectures and studied the specimens in the museum? As already said, he is not listed among the alumni of the university, and so is unlikely to have visit the museum as a student. One might perhaps expect Mounsey, a country curate serving Rector John Thoroton and the Duke of Rutland, to hold relatively conservative opinions, yet his fossiling and restoration work suggest a more liberal, progressive frame of mind. It was the latter part of the ‘Age of Enlightenment’, the period of free thinking and toleration, from John Locke to Tom Paine, which followed the Restoration in 1660 and gained strength after the Glorious Revolution of 1688, but was suppressed during the wars with France from 1793. It was a period of religious diversity in which Latitudinarianism, natural theology, Unitarianism and atheism were tolerated. It was a period of empiricism, of believing your own eyes, trusting your senses and reasoning, influenced by Francis Bacon. There were new scientific theories, in particular those of Isaac Newton, which led to the idea that the Earth and Heavens are governed by invariable laws, such as Newton’s gravitation, which implied that everything ran rather like clockwork, with God as the Divine Clockmaker. Though geology was in its infancy, there were many ‘savants’ with theories about the origin of the Earth. James Ussher (1581-1686), Primate of Ireland, had published a chronology purporting to establish the time and date of the Creation as the night preceding Sunday, 23rd of October, 4004 BC. This literal-minded ‘Scriptural Geology’ was one of the range of views that was widely held, another part of which was the literal ‘Diluvian’ belief in Noah’s Flood as sculpting land forms and depositing the remains of sea-creatures to become fossils left high and dry at the tops of mountains. A variation on this held that the ‘days’ of Creation were not literally days of 24 hours but were longer periods of uncertain but potentially long duration, so that there could have been a long expanse of ‘antediluvian’ time before the Flood. This developed into the ‘Catastrophist’ position which held that there had been a series of global catastrophes of which Noah’s flood was the latest. Another theory was the ‘Neptunism’ of the german geologist Abraham Werner, in which the primaeval Earth had been immersed beneath a hot, deep, salt-rich ocean: as this cooled down rocks had formed by chemical precipitation from this ocean, the amount of remaining ocean decreased, and it became progressively more shallow. Eventually, the deposited rocks emerged to form the land masses containing fossils of creatures that originally lived on the seabed, and the remaining oceans became cold, retaining only a small fraction of their original salinity. Philosophically furthest from the literal interpretation of Scripture, was the ‘Uniformitarian’ theory of James Hutton, who maintained that repeated episodes of uplift and submergence of the Earth’s surface had creating the land and sea, proceeding in cycles with no overall progressive change. In his view there was no evidence of a beginning or prospect of an end, so that the Earth was in effect of infinite age, denying that the biblical Creation had happened. What William Mounsey made of all this is not known. Neptunism and Uniformitarianism were very new in the 1770s, and it is far more likely that he would have held Diluvian or Catastrophist views. When collected fossils and observing the rocks, his motive was to explore the glory of God’s Creation. He may well have thought he was gathering evidence of the effects of the Flood which had immersed the land, leaving shells of sea creatures and bones of drowned animals within the sands and muds that were deposited before the floodwaters receded. Perhaps it is also significance that William Mounsey was concerned with the systematic collecting of rocks and fossils within a well-defined area, the confines of his parish. It was a time when Enlightenment theorising was beginning to give way to the systematic, unbiased, observation and experiment -based approaches that came to dominate science in the 19th Century and ever since. Too many theories had been invented by aristocratic savants resting on insufficient evidence, and the need for a solid body of observations became recognised. It is tempting to see him as at the cusp of the changing mood from empirical theories to the search for hard data and disdain for weakly-founded theories. It is tempting to place him as one of a new breed, at the ‘cutting edge’, in his own quiet way. This page was added on 09/10/2010. There is plaque on the northern exterior wall of Staunton Church in memory of John Mounsey who was curate for 50 years. He died aged 77 on 3rd May 1827. Staunton is a few miles to the north of Bottsford. If William and John were related it could explain William’s presence in the area or vice versa. Presentation Deed: Sproxton with Saltby (Leicestershire), Vicarage Reference Name DIOC/PD/174/7 Henry Willson Salmon MA(William Mounsey, decd). Patron: John Henry, duke of Rutland. Keep us one jump ahead - if you spot his descendants let us know!